We had a street fair in our town this past weekend. Since it was started a few years ago, it’s become a favorite for all the locals. What’s not to like about local business booths, kiddie rides, junk food, snow cones, music bands, and a beer garden? Oh, wait, but I’m forgetting something. Cows. 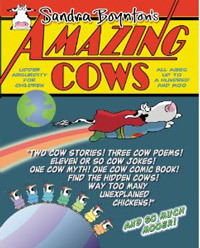 Yes, cows. I actually spotted a couple of them there. The first one appeared right in front of me as I was walking up and down the aisles. 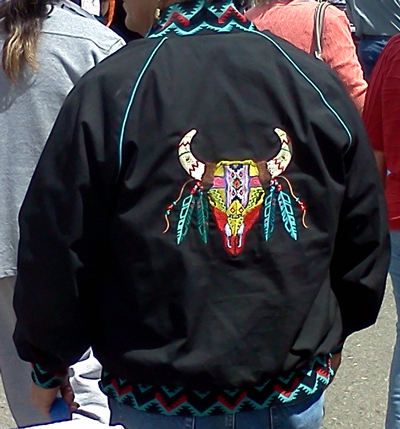 Check this work of art, a great colorful cow skull rendition on a jacket. 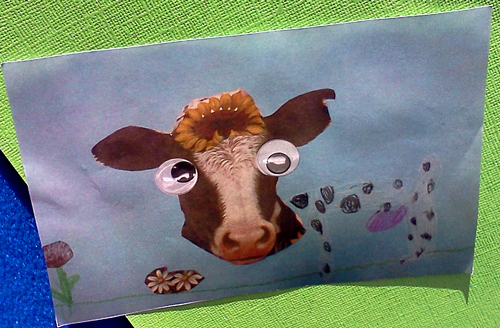 I spotted the second cow in the booth advertising the after-school programs. They sometimes offer art classes for kids who participate in the after-school programs while their parents are still at work. 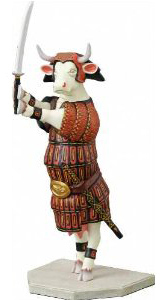 That is some goofy looking cow! Its spotted body looks more like a dalmatian, don’t you think?